Cranial cruciate ligament (CCL) disease is one of the most common and debilitating orthopaedic diseases seen in dogs. The CCL is an important ligament in the stifle (knee) of the dog. Its major function is to stabilise the stifle (knee) joint. Stretching or rupture of the ligament leads to instability in the stifle joint, which in turn leads to lameness, osteoarthritis and possible damage to the menisci (knee cartilages). In human medicine, rupture of the anterior cruciate ligament (ACL) is a common sporting injury associated with overextension of the knee joint. This is seen occasionally in dogs, such as after landing on uneven ground when jumping to catch a frisbee. In dogs, the more typical presentation is a gradual onset of lameness that gets worse with exercise and over time. There may be some stretching or small partial tearing of the CCL over time leading to osteoarthritis and thickening of the joint, often already present by the time the pet first presents for examination. This is termed cranial cruciate ligament disease. As disease progresses, this can lead to complete rupture of the CCL and injury to other structures such as the menisci (joint cartilages). The exact cause of cranial cruciate ligament disease is unknown but is thought to be associated with relative overloading of the ligament, possibly caused by an imbalance of other structures supporting the knee joint. A major difference between dogs and humans is that, in dogs, the weight bearing surface of the knee joint – the tibial plateau- slopes backwards. This leads to an inherent force within the knee whenever the limb is weight-bearing called the cranial tibial thrust. Once rupture has taken place, there is very little capacity for healing of the cranial cruciate ligament. This is partly due to poor blood supply within the ligament and partly due to ongoing shear forces within the joint. It can occur in any breed of dog but is seen most commonly in large breeds such as Rottweilers, Labrador and Golden Retrievers, Boxers and Mastiffs. Cranial cruciate ligament disease is seen at any age from late adolescence onwards and in approximately 50-70% of patients both stifle joints will eventually become affected. If your dog has a cruciate injury, ‘The 7 Mistakes Pet Owners Make When Their Dog Has Cruciate Injury or Surgery’ is an absolute must read. The dogs with a true traumatic injury to the CCL will present with acute onset of pelvic limb lameness, swelling, instability and pain on flexion and extension of the stifle, often with a palpable ‘clunk’ if meniscal injury is present. Dogs with CCL disease may also present with an acute lameness as the first indication of a problem, but on examination of the stifle joint, there is already evident, medial periarticular fibrosis, and atrophy of the thigh muscles of the affected limb. On further questioning, it often becomes evident that the dog has, in fact, had some signs of the disease – either several episodes of lameness after exercise that resolved with rest, stiffness on rising after excessive exercise, or reduced exercise tolerance, or reluctance to jump into the car. Your pet will require a thorough veterinary examination and often radiographs to determine the extent of the disease or injury and help determine the best treatment. Once there is some instability present in the joint, surgery is often required to prevent rapid progression of arthritis, reduce pain and restore mobility to the dog. The most common methods of surgical repair are a TPLO (tibial plateau leveling osteotomy) or extracapsular stabilisation procedure. You will need to discuss your pet’s situation with their veterinarian to determine the most suitable option. Recently stifle braces have become more widely available to assist in the management of dogs with CCL injury or disease, not being managed by surgery. These can prevent the instability in the stifle that occurs during weight bearing, but can only be worn during the daytime, so exercise would need to be restricted overnight. If you have already read 'The 7 Mistakes Pet Owners Make With Their Dog Has A Cruciate Injury', this is your important next step. Physiotherapy and rehabilitation are imperative to the success of either surgical or conservative management of cranial cruciate ligament disease. At Dogs In Motion, we will work with your pet’s veterinary surgeon to provide your pet with a tailored intense rehabilitation program, specific to your pet’s needs and time since injury or surgery. 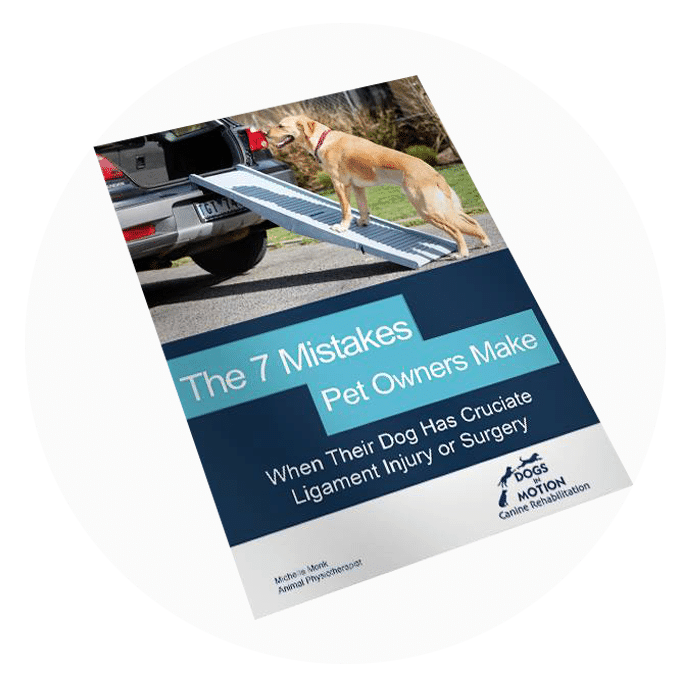 Download our guide 'The 7 Mistakes Pet Owners Make When Their Dogs Has Had Cruciate Ligament Injury or Surgery' to help ensure you don't make these errors! Treatment ideally would start 5 -7 days after injury or surgery, or on diagnosis if being managed conservatively. Treatment may include manual therapy techniques such as massage and joint mobilisation, modalities such as heat and ice, dry needling for pain relief, or prescription of a custom stifle brace. Advice on appropriate bedding will be provided to ensure your pet is well supported. Hydrotherapy plays an important role in the rehabilitation program for patients with CCL disease. Underwater treadmill is ideal for patients recovering from CCL surgery or disease. The buoyancy of the water means strengthening can commence earlier, whist protecting healing structures. This is ideally performed 2-3 times per week for acceleration of muscle growth. Strengthening of the surrounding muscles will help support the stifle and reduce pain as exercise increases. Overall, the prognosis in most cases of CCL disease or injury is good once the stifle is stabilised adequately. Rehabilitation back to normal function can take from 3-6 months depending on severity and duration of injury and compliance with the rehabilitation program.